The FORGE site is in a renewable energy hub. 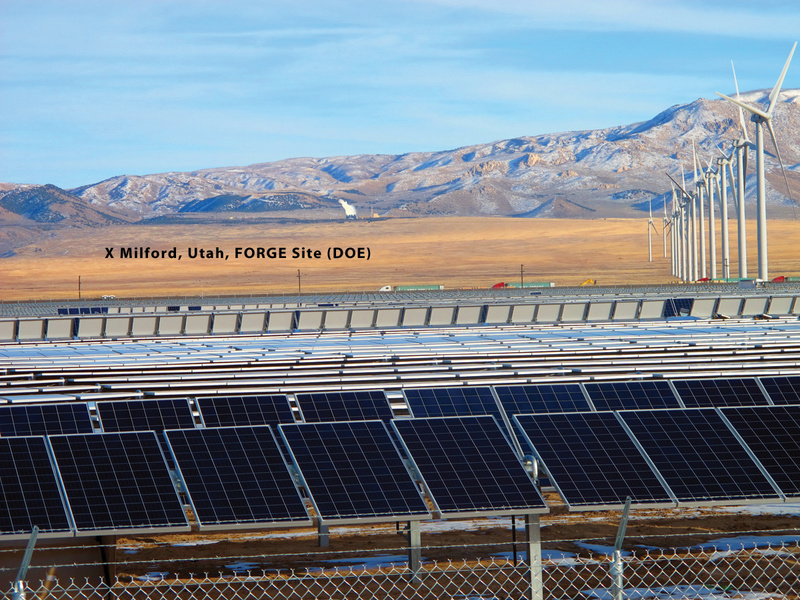 This view shows the SunEdison photovoltaic array under construction in the foreground, a FirstWind turbine array in the middle distance, and PacifiCorp’s Blundell geothermal power plant in front of the Mineral Mountains in the far distance. Photo by Mark Milligan. The U.S. Department of Energy (DOE) has begun a large geothermal project, known as FORGE (Frontier Observatory for Research in Geothermal Energy), to establish a field laboratory aimed at advancing and developing new technologies for geothermal power generation. Traditional geothermal power plants have wells that tap hot water or steam in naturally fractured rock (that is, a reservoir), and this fluid generates power as it is cooled at the surface in the plant before being injected back into the underlying reservoir rock. Utah has three such plants, all in Beaver County: Blundell (34 megawatts [MW] gross, owned by PacifiCorp Energy), Thermo No. 1 (10 MW, Cyrq Energy), and Cove Fort (25 MW, Enel Green Power). It has long been recognized that both the size of existing geothermal developments and opportunities for new developments are limited by a lack of well productivity. We can find large areas with hot rock at drillable depth, but frequently the volume that is naturally fractured and “productive” is much smaller. Over the past decade, horizontal drilling and the development of fracturing technologies that improve connection between wellbores and adjacent rock have transformed oil and gas production from tight (low-productivity) shale rock. The goal of the FORGE project is to apply these hydrocarbon technologies to hot, tight rock to create fractured zones around geothermal wells. Cold water can be injected into one well so that it moves through the fractures and becomes heated before being intercepted by an adjacent well (the production well), releasing its heat at the surface in a power plant. This technology is sometimes called Enhanced, or Engineered, Geothermal Systems(EGS). Modern power plants typically use a binary (secondary) system where a working fluid absorbs the heat energy of the hot water, flows through turbines to generate electrical power, and is air-cooled with large fans before repeating the process. The cooled water exiting the power plant is reinjected creating, in effect, a closed-loop circulation system where loss of water and environmental impacts are minimized. DOE has specified that the ideal FORGE site will have crystalline host rock at a temperature of 175–225°C (350–440°F) between 1.5 and 4 kilometers depth (5,000–13,000 feet). Of the numerous sites that were initially proposed, DOE selected five for Phase 1, a desk-top assessment of the available data. A site near Milford, Utah, about 3 miles west of the Blundell power plant, was one of the Phase 1 sites. The team investigating the Milford site is led by the Energy & Geoscience Institute at the University of Utah, with the Utah Geological Survey (UGS) being a major partner. At the time of writing this article, the Phase 1 reports have been written, and the teams have presented their findings to DOE in Washington, D.C.
Later in 2016, the best two or three sites will be selected to proceed to Phase 2, which allows completion of environmental clearances and fieldwork to improve site characterization. Announcement of the winning site is expected in early 2018, with less than a year to set up the facilities, and then five additional years to drill the deep wells, test stimulation and monitoring technologies, and carry out circulation experiments to optimize techniques for extracting the heat from the hot rock. The site will be decommissioned at the end of the five-year technology testing period. If the technology advances have been successful it is hoped that geothermal industry participants will look to develop and expand the site for commercial power generation. It is also hoped that the new technologies can be replicated at many other places around the U.S. Phase 1 work found that the Milford site has many positive attributes that make it an ideal site for the FORGE field laboratory. The site is unusually rich in exploration data because during the late 1970s there were at least five companies drilling wells around Roosevelt Hot Springs (RHS) trying to locate the best area for geothermal power generation. Also, DOE at that time funded researchers at the University of Utah to study RHS so that more could be learned about this type of hydrothermal system. Over 80 thermal gradient wells (typically to about 500 feet depth) and over 20 deep wells (to 13,000 feet depth) were drilled and had data available for analysis. The characteristics of RHS were documented in over 20 theses, ensuring that the exploration data were preserved. Reinterpretation of these data shows a 2-square-mile area on non-federal, undeveloped land has the required thermal regime for FORGE in a granitic host rock, with temperatures of around 200°C (400°F) at a depth of 2.5 kilometers (8,000 feet). The granite surface is between 0.5 and 1 kilometer (1,600–3,300 feet) depth, and the minimum temperature threshold of 175°C (350°F) for the engineered reservoir is at 2 kilometers (6,600 feet) depth. An attractive feature of the Milford site is the easy access with several county-maintained roads leading to our preferred deep drill site, and the city of Milford with its accommodations, eating establishments, and supporting infrastructure just 10 miles away. DOE considers outreach to the public important, as well as the possibilities of educational opportunities demonstrating the role of geothermal power in future power generation. Adjacent to the proposed FORGE site is the Blundell geothermal plant, the FirstWind facility (306 MW capacity), and the SunEdison solar photovoltaic array (240 MW capacity). North Milford valley is also a major energy corridor to southern California with the IPP DC transmission line (2,400 MW), the Sigurd–Red Butte line (600 MW), and the Kern River natural gas line (2.3 bcf/day). FirstWind has set up a kiosk with educational displays, which could be expanded to include explanations on how other renewables such as geothermal and solar power can be integrated into the power grid. This area could become a place where visitors can get close to wind turbines, solar arrays, and geothermal facilities and learn about renewable power generation. If the Milford site is selected for Phase 2, the UGS will have a major role participating in the site characterization fieldwork, overseeing the environmental permitting process, assisting with the FORGE website, and coordinating outreach initiatives. The Utah Core Research Center will also be the main repository for core and cuttings retrieved from the site, and will be available for visiting researchers to later study this material. If the Milford site is finally chosen as the field laboratory, the UGS will be involved in geothermal research at this site for at least the next six years, and will be making a major contribution to Utah’s renewable power resources. For more information, see the FORGE website at http://energy.gov/eere/forge/forge-home. Glad You Asked: What geologic hazards should I be aware of as a homeowner in Utah?